A wildfire that has killed three people and scorched about 46 square miles in northeastern Utah has prompted the evacuation of hundreds of people from nearby towns and forced authorities to close a national forest to the public. The fire began spreading into the Ashley National Forest on Sunday afternoon, prompting federal authorities to close the forest to public use. The Federal Emergency Management Agency said about 300 people are under a mandatory evacuation. Another 150 homes could be threatened by Tuesday, said Derek Jensen, a FEMA spokesman. In California, a wildfire that destroyed at least 254 homes south of Lake Tahoe was 95 percent contained late Sunday, the U.S. Forest Service said. Crews also battled a wildfire Sunday that had blackened more than 482 acres of brush in a rugged area of Santa Barbara County near popular campsites and swimming holes. That fire, which started Saturday evening, was 60 percent contained early Monday, U.S. Forest Service spokesman Robert Rainwater said. The blaze had closed some campgrounds, but no residents had been ordered to leave their homes, he said. The cause of the fire was under investigation. 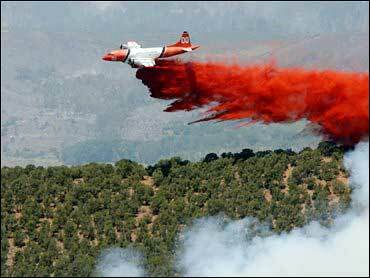 A pair of wildfires also burned near the town of Julian about 60 miles east of San Diego. The larger of the two had consumed 110 acres and was 20 percent contained by Sunday night, authorities said. The other blaze to the west blackened about 60 acres. Firefighters in Los Angeles County fought a 50-acre blaze near Pyramid Lake on Sunday before it was contained in the early evening. The blaze was ignited by a vehicle that caught fire, officials said.